Yup - that's New London/Boston/East End staging under there. 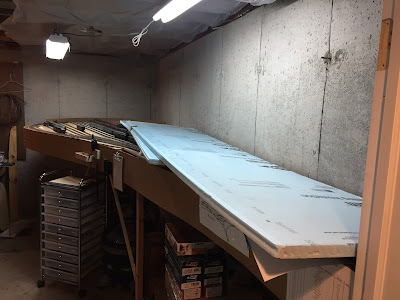 Apparently, the dry air dried out what little adhesive I had keeping these spare foam boards upright. And down they came - right on top of my staging yard. Fortunately, they rested on top of a very robust and sturdy Atlas S-2 (the old one, without easily breakable details...). Going forward, I relied, not on tape and such, but an actual mechanical clamp to hold things up. So, enough of what all I discovered - here's what I actually did about it all. . . Despite my success with using a humidifer to settle the track down in Goff Brook, I decided to do a little "belt-&-suspenders" and cut some expansion gaps as well. I first used a Dremel with a cut-off disc. Then I used a razor saw. Let me know which method you think I'll use next time - and from now on . 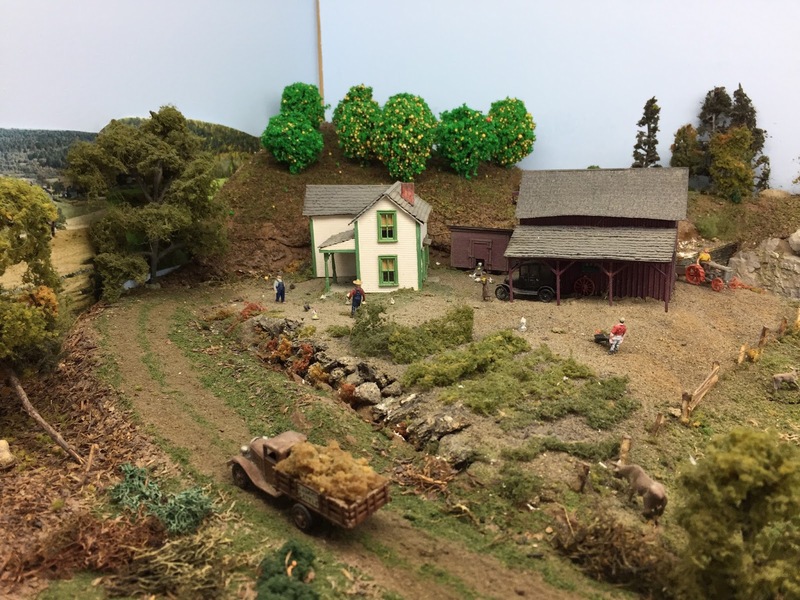 . .
And now for the Sublime - Actual Model Railroad Work - and SCENERY to boot! Last time I was at the "south" end of Somerset, I did the static grass. This time, I did a little more to disguise the hole in the backdrop, including adding a couple of foreground trees, as well as (and most effectively) adding a bit of backdrop behind the hole. Here's a better, over-all shot of that area. It's certainly not perfect, but much better than what was there before. Which was, um, nothing. But fairly effective for the 10 minutes it took to do. Speaking of trees, I also added some trees and bushes (old lichen) to the area between the box factory and the station. Adding 3D trees to complement the trees on the photo backdrop really ties the scene together. And some bushes to the right of the station softens the transition between the horizontal and vertical scenes. Lastly, I opened up a bunch of boxes of old (and I mean really old - like "from the 1970s" old) Life-Like trees to see if I could use any of them on the modules as practice. Well, I'll definitely have to modify them to make them look less fake, but I thought the trees in the photo above would work as-is as an orchard for the farm. You can see them there back on the hillside in the corner. But before I do any more scenery, I need to clean up the mess and prepare for my first ops session of 2018. All in all, not too bad a weekend! I too cut rail gaps with a Drexel tool at first, and got results like yours. Then I tried an Atlas track saw and did much better. The blade is only 10 thousandths inch wide. You should fill the gap with ABS plastic. The gray color will make the gap nearly invisible.